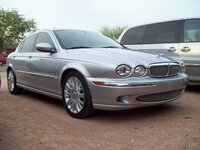 Start a new Jaguar X-TYPE question. From what I have read/watched, you take the battery out to fill with transmission fluid- all videos look like the battery is in the front, mine is in the back....where do I find it? The X-Type has served as Jaguar's entry-level model since it arrived in 2001. It is built from Ford's CDW27 platform, which it shares with past models like the Ford Mondeo, Ford Contour, Mercury Mystique, and Mercury Cougar. While the X-Type embodies more of Ford's engineering and components than Jaguar's, its design borrows many elements from the Jaguar XJ sedans. The X-Type has not been very successful against its most direct competition, with the comparably priced BMW 3 Series outselling it by nearly a 10-to-1 ratio in recent years. However, it does account for more than one-third of Jaguar's total U.S. sales. It certainly is an easier car to buy, with a base price about $30,000 less than that of the XJ. The current X-Types are powered by a comparatively modest 3.0-liter DOHC V6 that provides 227 horsepower and 206 lb-ft of torque. This is also the only Jaguar to use a 5-speed automatic transmission. While the X-Type is lightweight and not incredibly powerful, its fuel economy is lowered a bit by the full-time AWD. The EPA estimates 18 mpg city/24 highway for both models. Because the X-Types are positioned well below the other Jaguar models in price, their option list is a bit more comprehensive. Jaguar has also adjusted some of the packages for this year. Both models are equipped with leather seating, wood trim, full power accessories, cruise control and a power driver's seat. 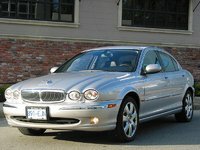 The sedan will feel more like a Jag if the optional luxury package is added. This includes rain-sensing wipers, a memory function power seat for the driver, a burl walnut finish and piping on the seats.